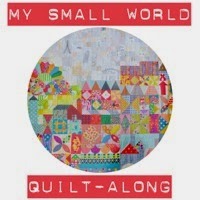 Welcome to the start of the My Small World Quilt-along. Hopefully your supplies have arrived or are only days away and you can start your preparation. This is an introductory post with the schedule and a few ideas to help you prepare for the construction of part one and making the rest of the quilt. You can check out the rest of the host teams' thoughts at Cindys, John's, Megan's, Danielle's and Lisa's blogs and IG feeds for progress hints, and tips-please allow for different time zones for these posts. The Instagram hashtag #mysmallworldqal will take you to these too! I recommend having a thorough read of the instructions before you start- note the diagram error on page 61. 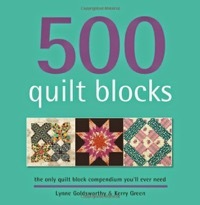 Originally Quiltmania magazine created a PDF file with corrections for this but they have now withdrawn it. You can see some details on this blog post from John/QuiltDad. Jen Kingwell published the corrected pattern herself and it available on her website. Another minor error to note is on page 74, the larger semi circle template is missing it's label- it is BF. Note the size of the quilt too, 33" x 52" and many of the pieces are very small. I'm getting zip lock bags labelled as I cut out different sections for later construction. There's more info and links further down this post for those wishing to increase the size. The sky area features in parts 1-5 of the construction sections so you may want to at least get your fabrics out to plan and maybe get cutting too, there are a lot of little squares involved! I added a little aqua and yellow to my palette but kept it very light and low contrast. I know a few participants are interested in having a blue sky. Charise of Charise Creates has already started hers and the Blue Skies picture below shows how pretty the aqua and cream low volume fabric look together. 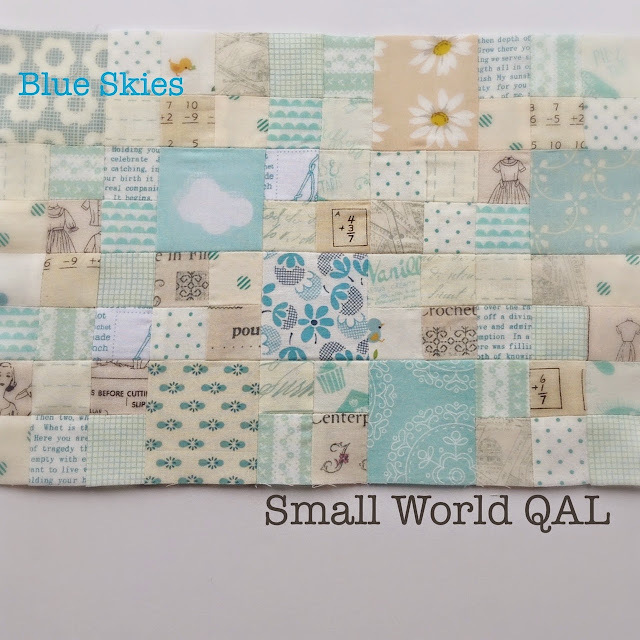 I would also recommend a look at the hashtag #mysmallworldqal on instagram to see how other skies look as a few people have already started sewing. You will find @vickidjl (of Sew Inspired) photo which is another very pretty cream and aqua sky. Most people will be machine sewing this quilt. It is template based, and could also be hand pieced if that is your preference. For templates, I used a mix of template plastic, old Paperchase notebook covers- these make for thicker templates, great for drawing around and freezer paper. I used freezer paper for some of the curved templates that only have one piece to cut out and I will use it for making lots of the AE/iorange peel templates to appliqué on. Remember to chose either imperial inch (pink outlined templates) templates or metric (black outlined templates)- don't mix together, plus there are also templates are suitable for both measurement systems also shown in black. I use a ¼" quilter's wheel to create the seam allowance on fabric with the curved templates. Incompetech allows you to print a range of shapes- hexagons, 60 degree triangles etc at specific sizes for free e.g. for English paper pieced hexagons in part 5. I use Karen Buckley's Perfect Circles for appliquéing circles. I am going to make a start on some of these early on-I think the clamshells are something I will start preparing sooner rather than later. EPP takes me ages and hurts my hands- even the preparation of those hexagons takes some time. I think I will hand sew these together but along the seam lines and without papers. Sue of Jersey-Scraper has offered pre cut hexagons for the price of postage- contact her for this and also for a low volume strip swap for the sky. As different hosts cover their section of the quilt along, they will share some of their methods and decisions. So far, I have decided not to include embroidery and I will be using needle turn appliqué for all appliqué shapes. I am not a huge fan of planning quilts which is the reason Jen Kingwell's quilts appeal to me. 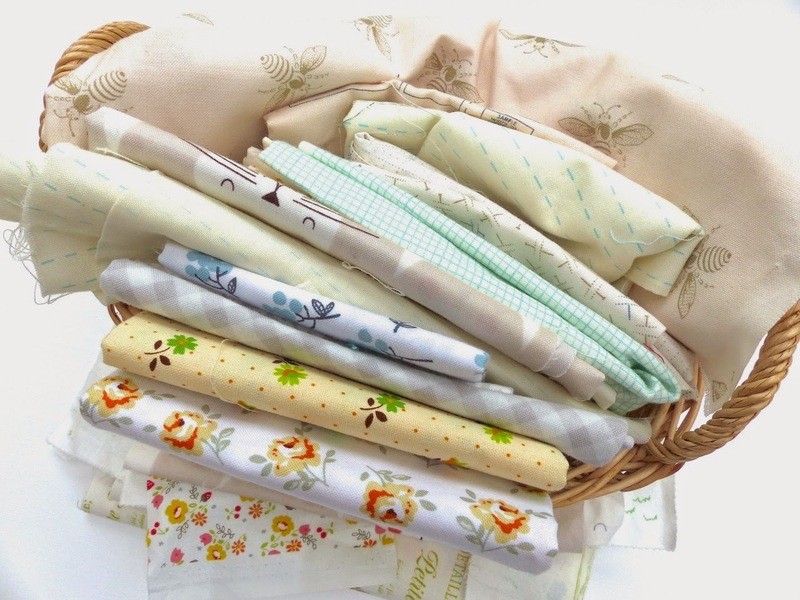 The scrappy palette means I won't have to buy new fabrics, scraps and stash will suffice beautifully. I am thinking about how much contrast I want to create. Viewing Jen's quilt through a black and white filter shows the contrast levels amongst the scrappiness and they are relatively low. I am thinking of a sightly stronger contrast although I am guessing it will evolve as I sew. I photographed some fabric pulls as an aide memoire when I come to cut buildings and roof tops so I can recall the colours I liked. Sizing up is something I know has come up on Instagram discussions. I will be sticking to the standard size as this quilt is going on my sofa so is just the right size. There are a number of options for increasing the size. Lisa is considering this so you might want to read what she says and Cindy is also looking at this option. 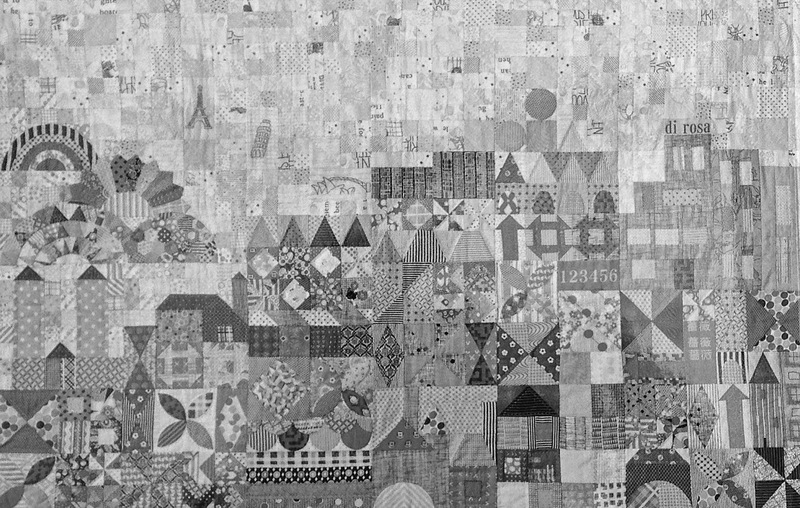 Jo of a Life in Lists is expanding the quilt by repeating chunks of sections and adding a lot more sky- you can see her plans in her sketch below. She is also following this up with a detailed post on her blog. This method means that the size of the pieces remains the same- there's just a lot more of them. 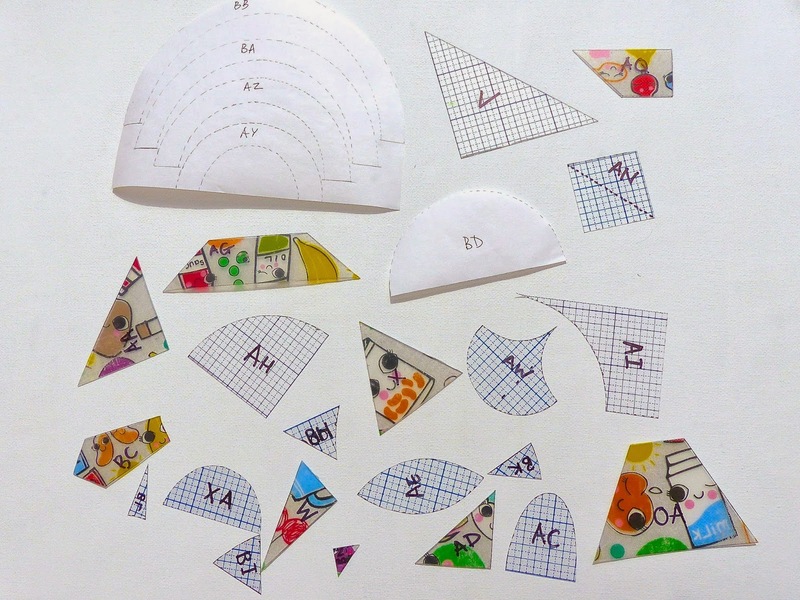 Another alternative is to double the size of the pieces by reproducing the templates at 200% and resize the rotary cut pieces- remember the size for these in the pattern includes seam allowances consider this in your calculations! For example, a rotary cut 2 ½" square will double up to become a 4½" square including the seam allowances. A few thoughts about the quilt along in general. 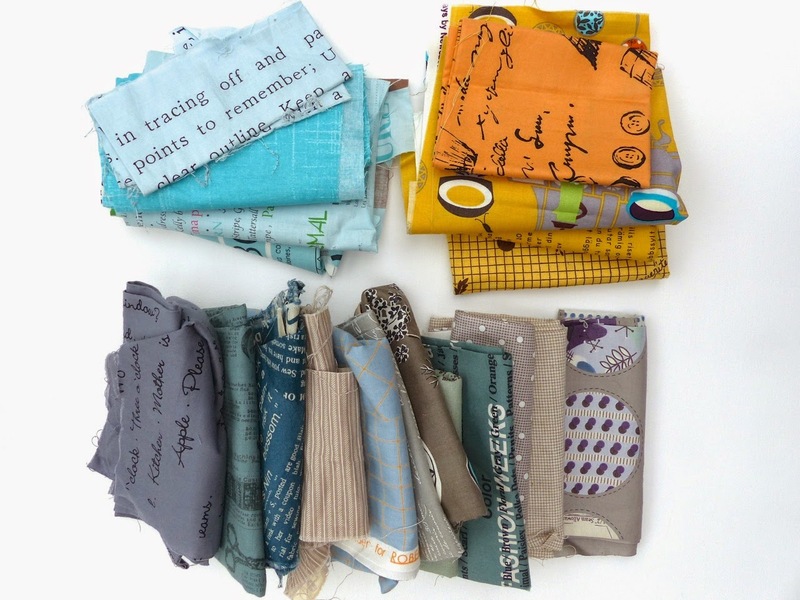 As it is Jen Kingwell's pattern for Quiltmania we cannot give chunks of the pattern away- i.e. details about the size of each piece so posts will concentrate on skills involved e.g. appliqué or alternatives to sections you might want to change e.g English paper pieced hexagons. Jen and Quiltmania are following the progress of the quilt-along and looking forward to seeing your versions of My Small World! All the hosts agreed that the emphasis is on a community quilt along so we have not sought sponsors, prizes or a commercial aspect to the quilt-along so if you see anything along these lines on social media, it is not linked to us but to the individuals offering a giveaway, kits to buy etc. Instead, we wanted to host a fun, community quilt-along over the next few months and provide the motivation and a little help that we all need to get something we really want to do done! There is a Flickr group for those not on Instagram or still like the old style Flickr groups. Please continue to share on #mysmallworldqal on Instagram, Twitter and Flickr. There's no compulsion. This quilt along is to help and encourage not lay down the law. If you want to do something different, share it as others may want to do what you have done! The construction posts are timed during specific weeks rather than named dates so they may not be there early on Monday morning of that week but later in the week instead. 18th May Intro post - All hosts will be posting! Thanks for hosting!! Looking forward to see all the ideas and pictures! Your blue sky looks fabulous! Thank you for hosting the quilt-along! I love the community (non commercial) character. And for me it is a great motivator to get back to sewing after my move to a new house and new sewing room. I have to get my fabric in order! This looks like it's going to be a wonderful QAL (Jen's quilt is stunning) - I won't be joining in but I'll happily cheer everyone else! Lots of great info. Thanks!! It was such a treat to see the quilt in person at Market!!! I hope to start later in summer when other commitments are squared away. By then I'll be able to soak up all of the experience from other participants! Thank you for organizing. Love the community aspect. Hi Di, the templates do not include seam allowances. You trace the templates at their actual size, then when you draw round them on the reverse of the fabric you do then need to add your 1/4" seam allowance. I hope that helps. I think I will add a post to show this. Thanks so much for hosting this; this is going to be fun! Can't wait to see everyone's quilts! Oh! This is such a wonderful quilt along to start with! All the detail information and suggestions!! I am so happy that I jump in this quilt along even I am off so soon! I think I will try to finish part I before we hit the road! Thanks for all the information. I was just thinking about the seam allowances on the templates. They looked so small, but adding 1/4" seam allowance make so much sense to me now. I'm still waiting for my mag to arrive so your ideas and tips have been really helpful in making a start with selecting some fabrics and cutting out the sky patches. I recently organised all my scraps so it must have been serendipity that this QAL came along as it will be perfect to use my scraps. 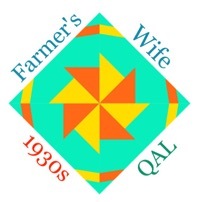 I have never heard of a quilter's wheel before... thank you! This is really helpful and I'm plucking up courage to join in this qal. All the small pieces rather unnerve me but the opportunity of personalising it to make it really my small world is exciting. Just a bit of advice please about templates from IG feed. Is another way to deal with the 1/4 inch allowance to cut out the template from the magazine stick it on card or plastic, then add the 1/4" allowance and then cut out a final template which incorporates the allowance. This means you only have to add the allowance on once. Or am I missing something? Hi Jenny, my preference is for transparent template plastic. It is more resilient to being drawn around than cardboard which starts to wear away and it is easier to see the grain and pattern on the wrong side of the fabric you are drawing on. By drawing round the template, you are giving yourself a seam line to stitch on to which can make the construction more accurate, especially when it comes to triangles and more tricky shapes when matching the corners up can be trickier. If you incorporate the seam allowance into the template it can make for inaccuracy- there are so many small pieces so a little extra here and there is going to add up! Many thanks. Yes I can see now what I was missing, the importance of the sewing line. And I can completely get the need for accuracy. I've just had delivered from the recent craftsy sale some gridded template plastic so no excuses! As you say this has the benefit of being able to centre the design if needed. Btw I'm enjoying all the posts on this qal. And am in awe of some of the amazing progress some have made! I have a humble request: is it possible to have the measurements for rotary cutting the pinwheel blocks, two sizes, and also the churndash blocks? There are some other blocks I would rotary cut too, the W/X triangle rectangles and AA squares (diagram 9). This would be most helpful, thank you in advance!! Love this quilt, but am not so familiar with templates on traditional blocks😀. Hi Elin, we can share techniques but as the pattern is by Jen Kingwell and owned by her and Quiltmania, we will not be able to give specific rotary cut sizes for lots of blocks. As the techniques come up on each part, I know the team hosts are ready to share lots of different ways of doing things but we must always respect the pattern owners! It is not a quilt that can be entirely rotary cut but there are ways round some of the blocks. Thank you! I understand this. I might have some challenges with the language, too. One last question: the measurements on diagram 7, 8 and 9, 4 inches, is that meant to be 4,5 inches with seam allowances? In that case, I have misunderstood. My panel seems to be too small, it ends up with 11 inches all sewn together, 12" minus seam allowances. first can I check that you have printed out your replacement diagram for diagram 9 as the wrong picture is shown? It is a little confusing. The sizes in the written instructions include the seam allowances and the sizes in the diagrams do not- they show the finished size which does not include the seam allowances. Follow the written instructions for all cutting, at the end of diagram 9, your panel should measure 4 ½" x 14 ½" including seam allowances. Thanks a lot! I eighter have to redo the panel, or adjust here and there... Yes I had printed the right one. The errata link is dead. I've tried contacting them for the correction and gotten no response. Any suggestions?